Vintage Sony Walkman cassette player. It’s been in a cupboard for years, just tested with new batteries and it works. Only thing missing is the foam ear pieces for the headset. ONLY WALKMAN AND HEADPHONE SALE. INCLUDING 80s STYLE ORIGINAL HEADPHONES. Works on 2 x AA Batteries or 3v AC Adaptor[Both not included]. Sony Walkman WM-DD . Condition is excellent for its age. Used. Dispatched with Royal Mail 2nd Class. SONY WALKMAN PERSONAL CASSETTE PLAYER. IN PERFECT WORKING CONDITION. Sony WM-EX194 Personal Cassette Player Walkman. (No Headphones Though). Used, but still in good condition - Sony Walkman cassette player. sony walkman cassette player WM-EX808HG. Condition is Seller refurbished. Dispatched with Royal Mail signed for 48 first class. I’ve had this Walkman from brand new, I remember purchasing it from Dixon’s in Basildon Essex. I’ve just got it back from being fully serviced, I had a new rubber drive band put in that turns the cassette wheels, the old one had seen better days. This Walkman is I great condition & full working order. The protection case / sleeve is in good condition apart from the Sony Logo being worn on the front from when used to put it in my inside jacket pocket strutting my stuff as a 14 year old. Happy Bidding, good luck, any questions don’t hesitate to ask. Stuart. This is the crown jewels of my collection. The first ever Walkman produced in July 1979. I'll add a couple of videos of the player in operation soon. I hope the pictures speak for themselves. Carry case with strap. SONY WALKMAN STEREO CASSETTE PLAYER. AS SEEN IN GUARDIANS OF THE GALAXY. IN PERFECT WORKING CONDITION. SONY WALKMAN PERSONAL CASSETTE PLAYER. IN EXCELLENT WORKING CONDITION. SONY WALKMAN PERSONAL CASSETTE PLAYER. Sony tc150 cassette recorder. The case is quite worn and one of the push studs is no longer in situ. SONY WM-EX505 Cassette Walkman All Metal GROOVE DOLBY MINT !!! SONY WM-EX505 Cassette Walkman. Automatic detection of Cassette type - Feather- Touch button operation. original Sony Earphones plus the external battery extension are supplied. 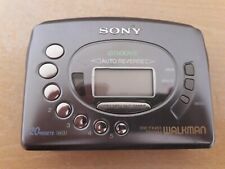 SONYWalkman used only once. In perfectcondition. Collector’s Item. Condition is Used. There are no blemishes or scratches (that I can see). Knowing the original owner, I think it was probably used in its case for it’s life then boxed after each use! This was found in a cupboard at my partners Grandmas house and nearly thrown in the bin! For sale a Sony Walkman WM-EX511 Personal Cassette Player in Silver. I have totally serviced this Walkman even to the extent of changing a noisy motor it has also had a clean re-lube and a new belt! SONY WALKMAN PERSONAL CASSETTE PLAYER. MADE IN JAPAN. IN EXCELLENT WORKING CONDITION. Sony Yellow Sports Walkman Radio / Cassette Player. Batteries and earphones are included. missing but it is still in fully working without it ( hopefully the photo shows this ). And small rubber flap cover for phones socket is missing. Sony wm bf44 walkman tape player - YouTube. Sony Sony WM-BF44 Walkman Tape cassette player. Player in good condition, with age related wear to body. Great working order, Just had two new belts fitted. Sony Walkman WM EX521 cassette player. Great sound with WME23 remote. This is a Sony Walkman WM EX521 cassette player that I don't use anymore and has been in a drawer for years. It uses one AA battery that is inserted when the lid is open and be careful to push the catch in the correct direction and then the flap opens. This is aSony WM-FX20 AM FM Radio Cassette Tape Player Walkman. It is a portable handheld device that plays standard audio/music cassette tapes. It also has an inbuilt AM FM Radio. Includes radio tuner for use while commuting or at the gym. Sony Walkman WM-B15. Condition is Used. Postage is via registered package mail. Any questions please ask. This is aSony WM-FX277 AM FM Radio Cassette Tape Player Walkman. It is a portable handheld device that plays standard audio/music cassette tapes. It also has an inbuilt AM FM Radio. Includes radio tuner for use while commuting or at the gym. NEW VERY RARE TO FIND IN ANY CONDITION WALKMAN WITH WINDING HEADPHONES. OPEN BOX FOR REFERENCE PHOTOS AND IF WORKING ALL OK AND TESTED AND ALL WORKS PERFECT. WORKING CONDITION:WALKMAN ALL WORKING HEADPHONES WORKING. Sony wm 33 Walkman tape player blue - YouTube. Sony Sony WM-33 Walkman Tape cassette player. Player in good condition, with age related wear to body. Great working order, Just had two new belts fitted. SONY Walkman WM-EX506. and use alongside my advert text to satisfy yourself on the condition of the item. Very very rare to find nice Sony Walkman in blue colour WORKING CONDITION TESTED ALL WORKING NEW DRIVE BELTS. Sony wm 33 Walkman tape player red - YouTube. Sony Sony WM-33 Walkman Tape cassette player. Player in good condition, with age related wear to body. Great working order, Just had two new belts fitted. This walkman featured a solar digital clock, alarm, calendar, and stopwatch with lap function. Another uncommon feature for this year was the dual headphone output. the button switch inside Walkman for fm/am select is missing you can change it with sim ejector the default is fm no need to change it again. Sony Walkman WM-FX121 FM/AM Radio AVLS. Fully Working Radio And Cassette. RARE. With Dolby NR. SONY WM-DDII in RED color . It is a great piece for any collector that you should not miss from your own collection! FOR SALE IS THE UNIT ONLY. GOOD WORKING ORDER. IT REQUIRES A GUM BATTERY WHICH IS NOT INCLUDED. Sony TCM-939 Portable Audio Cassette Recorder Player Built-in Microphone - Black. Condition is Used. Dispatched with Royal Mail 2nd Class. In good working order. Mains power lead not included. Sony Walkman - WM 4. Sony wm 31 walkman tape player - YouTube. Sony Sony WM-31 Walkman Tape cassette player. Player in good condition, with age related wear to body. Great working order, Just had two new belts fitted. Complete with battery cover and belt clip. Clip included. good working order. Sony Walkman WM-DD22. Sony Turbo Headphones MDR-W10. A beautiful piece of Sony history. User manual. Super rare. Sony WM-D6C restored very beautiful unit with rare "Pointed Amorphous Head"
It is an early WM-D6C with the older “pointed” parabolic amorphous head, which is considered to be the best type of head used on the D6C. I estimate that it was manufactured between 1984 and 1990, probably nearer to 1984. SONY WM-EX777 in Silver color. In perfect working condition and looks very good, almost mint condition i can say. It is a great piece for any collector that you should not miss from your own collection! Sony Walkman WM-DD10. Here you can see the presentations of my Sony Walkman A beautiful piece of Sony history. Sony WM-EX808 Walkman Cassette Player, Beautiful Blue Color !! Working Great ! !